John Gust was fed up. With teaching. With bureaucracy. And with an educational system that seemed more concerned with students' employment prospects than with their enrichment. So it was that he left his teaching post in the Los Angeles Unified School System. So it was that his return – prompted by economic necessity – was inauspicious. And so it was that his transformation began. Now, in the tradition of Kozol, Dennison, and Kohl, Gust shares that unfolding process in Round Peg, Square Hole a personal narrative that is at once provocative, moving, and often funny. The story begins when Gust – disillusioned, underpaid, and apprehensive – reluctantly accepts a teaching job in Watts, perhaps the nation's most notorious ghetto. Realizing how his sour state of mind would disadvantage his students, he decides to do something daring: he moves from his affluent Manhattan Beach neighborhood into the Compton Avenue Elementary School community. Here, he quickly realizes that conventional schooling techniques and state-mandated standards are wholly inadequate to the needs of his students. 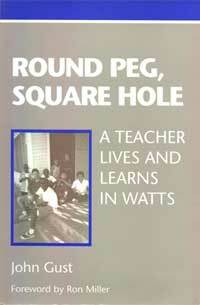 Round Peg, Square Hole takes us through Gust's quest for a more meaningful way of teaching – a journey that moves from the classroom to the playground to the streets to the homes of his Watts neighbors. This book will appeal to any teacher who has struggled to teach critical-thinking skills in an atmosphere geared toward compliance with state-mandated standards. It will resonate with anyone concerned with race relations, social action, and redefining our notions of community. And it will be essential reading for any teacher-novice or veteran – who wants to make a difference in the lives of students. This book is a rollicking first-person account of Gust's experiences-both in and out of school-wonderfully spiked with self-deprecating humor.